Padua is in the Veneto region of Italy, around 40km from Venice and is home to the Basilica di Sant'Antonio, frescoes by Giotto, and Europe's first botanical garden. You can take the train to Venice and be in the heart of things in less than half an hour. 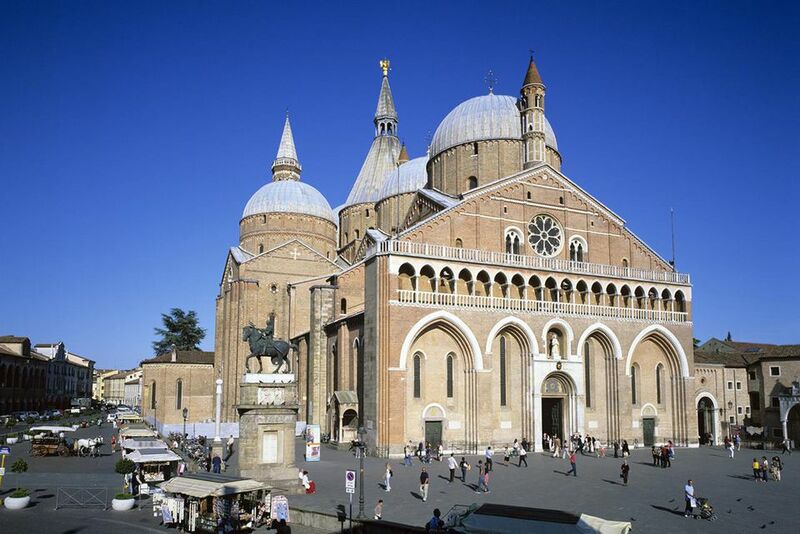 Padua is also a popular stop on the way to Verona, Milan, or Florence. Padova is a walled city situated along the Bachiglione River between Verona and Venice. If you come by train, the station (Stazione Ferroviania) is on the north side of town. The Basilica and Botanical gardens are found on the southern edge of town. Either the Corso del Popolo or the Viale Codalunga heading south will take you into the old center of town. Between the train station and the main part of Padua's historic center is the Scrovegni Chapel, consecrated in 1305. Don't miss the Giotto frescoes inside. The celebrated Basilica Pontificia di Sant'Antonio di Padova, sometimes called La Basilica del Santo is not Padova's main church -- an honor that falls to the Duomo, also called the Cathedral-Basilica of St. Mary of Padua. But Sant'Antonio is the one you need to visit. Construction began around 1232, a year after the death of Sant'Antonio; his relics are found in the baroque Treasury Chapel. There is a museum inside, the Anthonian Museum. There is another exhibit where you can learn about the life of Saint Anthony and the continuation of his work today. There are two cloisters to visit. Really, it's one of the most amazing religious complexes you'll visit. Places to stroll: The university on the east side of Via III Febbraio (the anatomy theater, built in 1594, is the oldest of its kind and can be visited on the Palazzo Bo tour), Piazza Cavour, the city's heart, and Prato Della Valle, the largest public square in Italy. When it's time for a drink, head on over to the 18th century Pedrocchi Café. The elegant bar and restaurant had a role in the 1848 riots against the Hapsburg monarchy. Between Sant'Antonio and the Prato della Valle is Padua's fantastic Orto Botanico. The symbol of Padua is the Palazzo della Ragione. It is the heart of the old town, surrounded by market squares piazza delle Erbe and the piazza dei Frutti. The hotel Grand'Italia is right in front of the train station if you prefer to stay nearby your transportation. The four star Art Deco hotel is air conditioned and has free Internet access. The Hotel Donatello is right across the street from the Basilica di Sant'Antonio and has a restaurant called Ristorante S. Antonio. While it may offend your sensibilities, Paduans have been eating horse for a long time, since the Lombards came, some say. If you didn't flinch, then try Sfilacci di Cavallo, which is made by cooking the leg for a long time, then smoking it, then pounding it until it breaks into threads. It looks like saffron threads in the market. Risotto is the first course of choice over pasta, but there are several bigoli (thick spaghetti with a hole in the center) dishes that are popular, sauced with duck ragu or anchovies. Pasta e Fagioli, a pasta and bean soup, is a signature dish of the area. Duck, goose, and piccione (squab or pigeon) are also popular. Food in Padova is a cut above the average fare in Venice. The best food is simple and made from fresh ingredients. A must-try restaurant in Padua is the Osteria Dal Capo on Via Dei Soncin, across the piazza del Duomo. Via Dei Soncin is a narrow, alley-like street directly across the piazza from the front of the Duomo. The sign on the door says the Dal Capo opens at 6 pm, but ignore it, they won't serve you until 7:30 pm. Moderate prices, good house wine. The menu changes daily and features typical Veneto cuisine. English is spoken, although it's best if you know a little Italian. Before dinner, you might try going for an aperitivo (cocktail, try the typical Italian Campari soda) at one of the two cafes that compete for customers in the Piazza Capitaniato to the north of the Duomo. One you'll notice attracts the young folk, the other the older crowd. There is a wine bar further north on the Via Dante. Imagine, today you can wander into the Botanical Gardens in Padua and visit a palm planted in 1585. In the Arboretum, a huge plane tree has been around since 1680, its trunk hollowed by a lightning strike. Insectivorous plants - Yep, the meat eaters of the plant kingdom have their own set of greenhouses. Watch your fingers. Medicinal and poisonous plants - This is the historical purpose of the garden's foundation in 1545. Itinerary for blind people - Aromatic or thorny plants are featured in pots so they can be changed throughout the year. Labels are written in Braille. Aquatic plants - Marvel at the number of different lilypads that are out there in the world. The botanical gardens are located just south of the Basilica di Sant'Antonio. From the piazza in front of the Basilica, walk south on the street that parallels the front of the Basilica.